$39.75 if purchased individually in store. You save $15.90 (40% off). Get an edge over your fellow students. Enter peak mental states for studying within minutes. Healthy alternative to caffeine or other potentially harmful chemicals. Helps you perform at your best when you need to. How Do the Study Aid Recordings Work? …and how do they increase your focus, memory and creativity? Although your brain produces activity across the whole of this frequency range, throughout the day and night, you will always have a dominant frequency, which will reflect how you are feeling and what you are doing in that moment. Brainwave entrainment audio technology provides a method of stimulating your brainwaves, using repetitive tones embedded into music. This type of brainwave entrainment music, can be used to guide your brainwave activity to peak mental states, associated with increased focus, concentration and memory power. 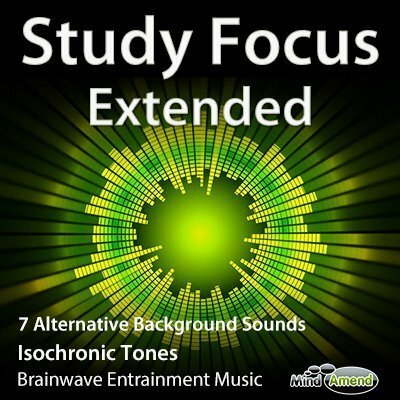 THE MIND AMEND STUDY AID RECORDINGS contain ‘isochronic tones', which beat at specific frequencies associated with peak states of focus, memory and brain power. 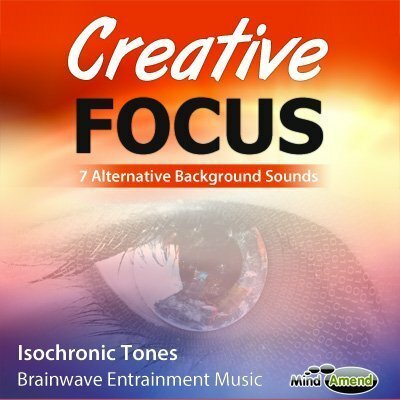 These isochronic tones sessions have been embedded into carefully crafted and selected music soundtracks, to produce the ultimate in brainwave entrainment study aid music. All you have to do is select the track, click play and listen, and the tones will stimulate your brainwaves and guide your brain to an optimum mental state for studying, helping you to avoid distractions and increase your concentration levels over long time periods. Distractions, lack of energy and motivation; these are just a few of the things which can contribute to a bad study session, where it's seems you just can't focus on anything and hardly get any work done. When you are feeling like this, your brainwave activity will be doing the opposite of what you want it to. Sometimes, drinking a cup of coffee or an energy drink can help. Maybe taking a break for a while, or switching to a different location to study helps. The Mind Amend audios use a process of gradually changing the frequency of the isochronic tones. This quickly guides your dominant brainwave activity into a state associated with peak performance, increasing your focus, memorization or creativity, depending on which audios you select to listen to. This allows you to switch your mind to your preferred mental state, almost at will, without having to resort to pumping your body full of caffeine, or any other potentially harmful drugs. Although this is a gradual process it works very quickly; usually within about 5 or 6 minutes. To do this, I use the power of another natural phenomena, called Frequency Following Response. 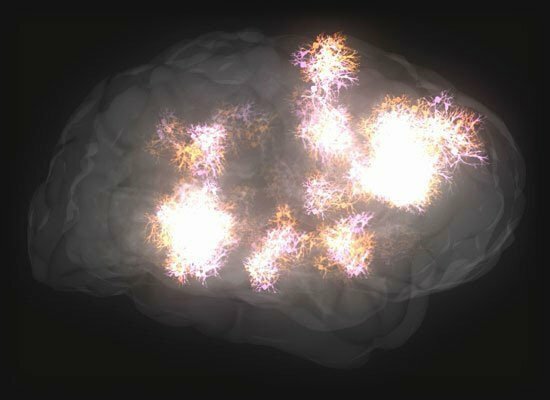 ONCE YOUR BRAINWAVES BECOME ENTRAINED and synchronized to the same frequency of the audio beat, the frequency of the beat can then be changed, and your dominant brainwave activity will carry on changing in step with it, and follow along pulsing at the same speed of the changing beat. 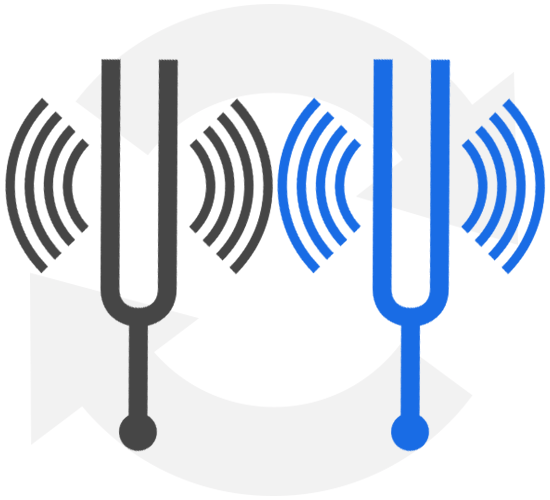 This process of synchronization and following the changing speed of the beat, is known as FFR (Frequency Following Response). 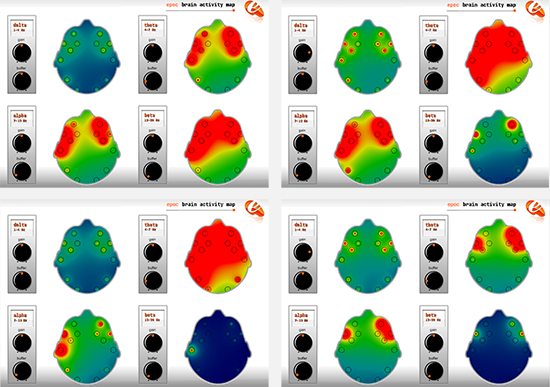 By using the power of FFR, your brainwave activity can be guided to more optimum mental states, improving your ability to focus, memorize information and stimulate creativity. 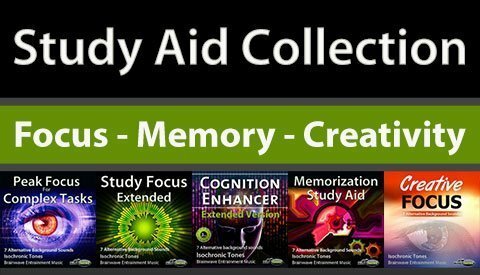 The Study Aid Collection gives you the ability to improve, enhance and change your mental state whenever you need to, to ensure you get the most out of every study session. Increasing your focus levels will help you get more done in less time. A healthier alternative to drinking coffee or energy drinks, or taking supplements. Effortlessly enter the peak mental states for studying within 5 to 6 minutes. This 3 hour session increases both beta brainwave activity, which increases focus and concentration, but also alpha activity, which helps to relax you. This combination of both beta and alpha stimulation, helps to produce a mental state of relaxed focus, which is ideal for studying, especially if you are stressed, on a deadline and under pressure to complete work within a short time frame. Use the Cognition Enhancer tracks to boost your concentration while studying, and to speed up your left brain, which is associated with logic, reasoning, analytical thinking, numbers and language. This session can also be helpful for relieving the symptoms of ADD/ADHD. I recommend using this particular session if you are studying or working under pressure, where perhaps you're experiencing mental blocks from over thinking/concentrating. Because these tracks cycle through lower alpha frequencies as well as beta, this combination can help produce a state of calm, focused thinking, allowing you to think faster and more clearly. You can use these tracks without headphones, but to get the most out of them I recommend that you wear headphones, because then you will benefit from the split hemisphere stimulation effects, which speed up your left brain. This session cycles down as low as 10Hz in Alpha, and up as high as 14Hz in your left ear and 17Hz in your right ear. The higher frequency sent to right ear, actually helps to speed up the opposite left brain hemisphere, to make that side more dominant. 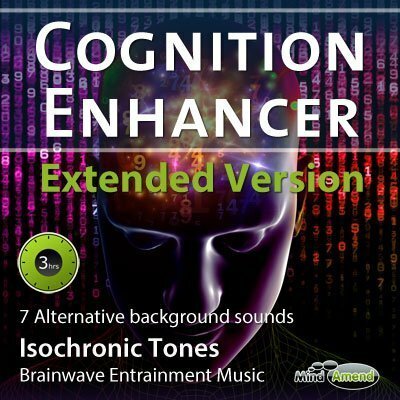 Each Cognition Enhancer Extended track is 3 hours long and made available for instant download after your purchase. Each mp3 track contains the same isochronic tones frequencies, but with a different soundtrack. Ambient 1, Ambient 2, Electronic, Orchestral 1, Orchestral 2, Piano, Just Tones – no soundtrack (see demos). This 3 hour isochronic tones session cycles through a frequency range of beta frequencies (14-17hz), which will help to boost your focus and concentration levels. It’s an ideal study aid music session when you want to increase your focus while studying, reading, or engaging in any mentally taxing activity over a longer period. In addition to the isochronic tones stimulation, the soundtracks in this session have also been embedded with an amplitude entrainment filter. This filter distorts the sound of the music, creating subtle vibrations in the sound, which vibrate in unison to the same frequency of the isochronic tones. This helps to add further weight to the brainwave entrainment process and increases the effect of the track. Listen to this track while studying, reading, working etc., with your eyes open. You don't have to concentrate on the tones, so just have this on in the background and focus on what you are doing. You do not need headphones when using the Study Focus tracks. However, if you are studying somewhere a bit noisy I'd recommend using headphones, as this will help block out the external distractions. The Study Focus session cycles up and down between the 14-17Hz range in beta. It starts at 14Hz and takes 3 minutes to ramp up to 17Hz, then another 3 minutes to ramp back down to 14Hz. This cycle is then repeated throughout the track. Snapshot of the how the isochronic tones frequencies are structured. Click to enlarge. Each Study Focus Extended track is 3 hours long and made available for instant download after your purchase. Ambient, Classical, Electronic, Guitar, Intensity, Pulsating Synth, Just Tones – no soundtrack (see demos). These extended 3 hour tracks are specifically designed for memorizing information over a longer study period. Once you have mastered and understood the material you are learning, you can help improve your ability to memorize and recall that information, by revising and absorbing it while in a more relaxed Alpha state. The main goal of these tracks is to increase activity of the 10.2Hz brainwave frequency in Alpha, but also boosting levels of low Beta activity as well. Beta is the frequency range you would normally be experiencing while awake and alert during the daytime, and Alpha is a more relaxed state just below that. If you are still trying to grasp and understand the subject matter, you may benefit more by listening to the Cognition Enhancer, Study Focus or Peak Focus tracks, because they will increase your concentration with higher Beta activity. Memorization Study Aid works best when you have already learnt and understood the material you are studying, but you want to commit large amounts of information to memory, like facts, dates, places, formulas etc., to recall later on for tests and exams. This session does not require headphones. 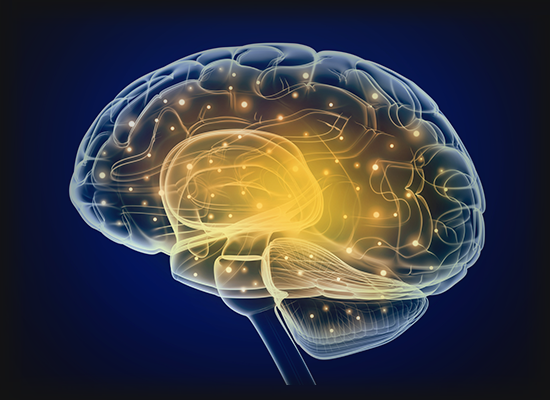 The main focus is on increasing 10.2Hz brainwave activity in Alpha. The isochronic tones begin at 10.2Hz for 6 minutes, then ramp up to 12Hz at the bottom of Beta for 2 minutes, then back down to 10.2Hz. This intermittent burst of 12Hz in Beta is done to make sure you don't become too relaxed and drift off. 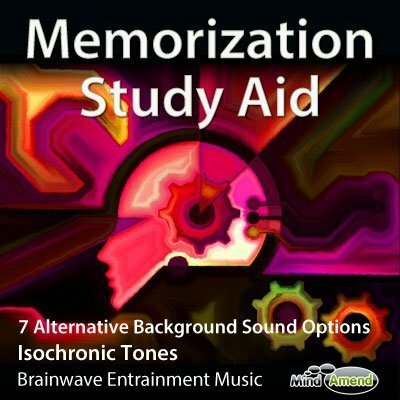 Each Memorization Study Aid track is 3 hours long and made available for instant download after your purchase. Ambient, Ambient Rhythm, Classical Chill, Light Relax, Orchestral, Whimsical Ambience, Just Tones – no soundtrack (see demos). 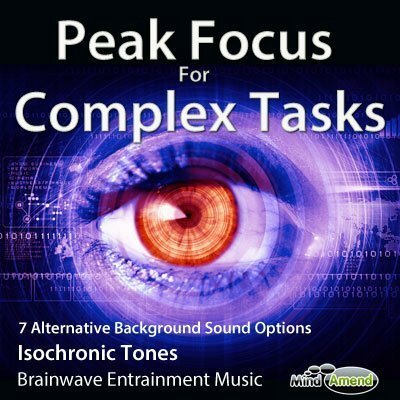 This 1 hour long isochronic tones session is for those complex tasks which require an intense period of focus and concentration. It can be hard to maintain a high state of intense focus for very long, but this track will help you to achieve that, by stimulating your brainwaves to high beta state and keeping you there for an extended period. This can be very useful when working on advanced mathematical calculations, scientific formulas, financial analysis and other difficult, complex mental activities. For a general study session I'd recommend using either Study Focus or Cognition Enhancer, because they are a little less intense than this one. But for those occasions when you need to step up your concentration and brain power a little further, these Peak Focus focus tracks are the ones to go for. This session will stimulate your brain up a little higher to 18Hz, where it stays there for the majority of the track, helping you to maintain a consistently high level of concentration and thought. The Peak Focus tracks do not require headphones. The track starts off beating at 10Hz and gradually ramps up to 18Hz in Beta by the 6 minute mark, where it stays and holds you for a full 48 minutes. At 54 minutes the beat frequency begins to gradually lower, guiding you back down to a more relaxed 10Hz state at 58 minutes, where it plays out to the end. Snapshot of how the isochronic tones session is structured. Click to enlarge. Each Peak Focus For Complex Tasks track is 1 hour long and made available for instant download after your purchase. Ambient Flow, Ambient Pulse, Ambient Ripples, Electronic, Orchestral, Piano, Just Tones – no soundtrack (see demos). These shorter 22.5 minute tracks are designed to help stimulate your creative side, while still keeping you alert and focused. This isochronic tones session alternates between low beta (14Hz), alpha (10.2Hz) and theta (5Hz) frequencies. The concept behind the track is to induce a mental state of creative focus, by stimulating low beta beta brainwave activity which is good for focusing, but also increasing alpha and theta activity, to promote a state of relaxed focus, allowing creativity and ideas to flow from your different mental states more freely. One way to use this session is to close your eyes, relax, and allow new ideas to flow through to you. Once the ideas start to flow pause the session, write them down, and resume the session afterwards. You may also choose to use the session with your eyes open, while working on artistic or creative projects. Headphones are not required for these tracks. The session begins at 14Hz in beta, where it holds for 2 minutes, before ramping down to 10.2Hz in Theta, where it again stays for 2 minutes, before ramping down to 5Hz in Theta, again holding for 2 minutes. The same cycle is repeated 3 times and finishes back at 14Hz where you began. A snapshot of how the isochronic tones frequency session is structured. Click to view larger image. Each Creative Focus track is 22 minutes long and made available for instant download after your purchase. Ambient, Beach Waves, Forest with Babbling Brook, Piano, Hybrid, Thunderstorm, Just Tones – no soundtrack (see demos). Each product comes with 7 mp3s, which comprises of 6 different soundtracks, plus 1 ‘just tones' version. All the mp3s are available for instant download, straight after your purchase. You can log into your account area and access your downloads at any time in the future. It would cost $39.75 if you purchased each product individually in the shop, but as a collection you save $15.90 (40% off). I want you to be extremely happy with every product you buy from me, which is why I give a ‘no hassle' money back guarantee. You have a full 60 days to properly try out every product you purchase. If during this time you are not happy with a product for any reason, I will refund you immediately in full.